London Biggin Hill Airport, now a major business jet hub for the capital and formerly RAF Biggin Hill, Battle of Britain fighter base and then home of RAF Officer and Aircrew Selection Centre, celebrates its 100th anniversary in 2017. This year's edition of the Festival of Flight took place over two days in August and featured, for the first time, a public arrivals day. It also featured strong international participation which included a superb - and surprising - UK debut. Sam Wise reviews the show for UK Airshow Review. Additional photography by Peter Reoch. The Friday before the show weekend saw, for the first time, an official arrivals day held for enthusiasts to view the show movements (though, on the day, a fair few locals were also present to soak up the show). It has to be said, it wasn't the busiest of affairs, especially in terms of show participants - but Spitfire T9 MJ627 was operating passenger flights throughout the day which kept assembled photographers entertained. There were a few interesting business jet movements to be had, as well as some based helicopters, but by and large the show movements were few, with most static and UK-based acts arriving on the Saturday morning. The most interesting of the Friday arrivals were the Czech contingent, especially with the stars of the show having to perform their validation display in the golden evening light. However, it was a very well run day, ticketing being through the show's website and parking not far from the designated enclosures, adequate food, drink and toilet facilities and, with the arrival in the afternoon of both rain and hail (! ), some much welcome shelter. Given the late-in-the-day movements of the show's stars, it must be appreciated that the show team allowed the visitors to stay quite late on for them. Plus, everyone got a free baseball cap, which was nice. Of the British civilian acts, the stand-out performances were the Breitling Wingwalkers and the Extra 300 display "Little and Large" display. The Wingwalkers' routine is perfectly suited to a venue the size of Biggin Hill, though with an on-crowd wind it was sometimes hard to make them out through their own smoke! With reasonably strong winds all weekend, the smaller aircraft such as the Great War Display Team, the TRIG Team and the Wingwalkers must be commended for carrying on their displays, especially when it involves climbing onto the top wing of an aeroplane. At the even smaller end of the scale the wonderful 'Little and Large' pairs display - a "standard" Extra 300 display flown by Chris Burkett (also a member of the Global Stars team) accompanied and mirrored by a 40% scale model of the same aircraft, flown in formation with its larger sibling by an operator on the ground. Certainly among the most novel of display acts out there, it was a superbly flown display by both elements and highly entertaining to watch in the sky - real star of the UK display scene. One surprising, if a little odd, moment came between the OV-10 Bronco display and the B-17G demonstration. Totally unannounced beforehand and for, seemingly, no real reason, the Bronco and the Flying Fortress gave a flypast over the runway in formation. Elly Sallingboe dedicated it to the show in tribute to the numerous times the B-17 has appeared at the airfield, but why these two aircraft were together isn't entirely clear. Not unwelcome but a little confusing. Of the UK military contribution, there were two noteworthy significances. 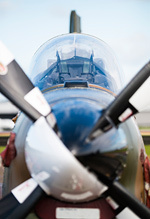 RAF Biggin Hill, as was, was the founding location of the Battle of Britain Memorial Flight and as such obviously holds great significance for the team. 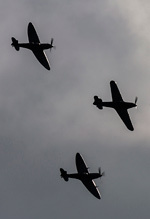 However, in the week beforehand the BBMF put out their announcement that they were temporarily ceasing operations of all their Merlin-engined aircraft. They still made an appearance with the Spitfire PRXIX, flown by Sqn Ldr Andy Millikin himself, but it is no doubt not the fitting tribute they'd have liked to offer. 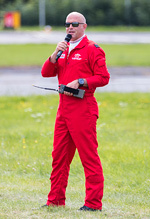 More successful was the fact that Sqn Ldr Mike Ling was able to commentate for the Red Arrows for their two displays at the show. 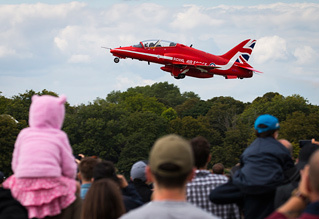 Lingy was actually born in Biggin Hill, so the show is very much his local - to the point that he attributes being inspired at one of the airport's shows leading him to pursue a career in the RAF. Given that this is his last year commentating for the team, this appearance will have been a poignant one. It was also very pleasing to see two Tucanos from 72 Squadron on static at the show - with the type not long left in service, it's nice to see them getting out and about as much as they have this season. 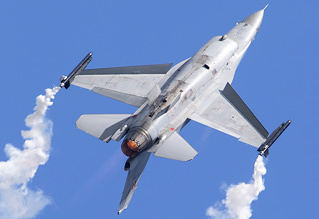 The show's real strength was the surprisingly varied and unique international contribution, a great achievement for a civilian airshow in this day and age. The Belgian Viper demonstration is no stranger to these shores, but for the enthusiast it was great to see an operationally schemed (albeit grey, of course) jet display after the "blizzard" painted airframe went unservicable on the Thursday after displaying at Eastbourne (the jets were using Biggin Hill as their base for that show). The Patrouille de France made their sole UK appearance at the show - though for the enthusiast it was their support aircraft that got by far the most attention. Virtually unseen in the UK, surprisingly the French Air Force sent one of their C-130H-30 Hercules' along with the team rather than the anticipated Transall, which remained at the show throughout the day. Some very happy aviation enthusiasts were made that day! 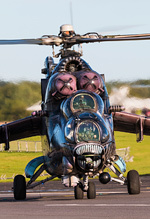 However, the stars of the show, by a long way, were the pair of Czech Air Force helicopters that arrived in some foul weather on the Friday afternoon. 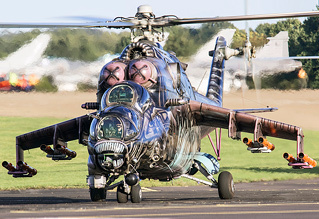 With reports of exactly how many were attending the show changing daily until they actually appeared on the horizon, in the end it was a single Mi-24V/35 'Hind' and a Mi-171Sh 'Hip' that arrived at the show, the former being the "Alien Tiger" painted airframe. The Hind performed its familiar solo display routine on both days, but it was the combo that really drew attention. 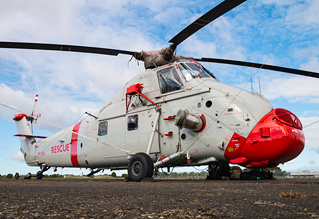 Together the Russian designed helicopters performed a Combat Search and Rescue demo, primarily seeing the Hind providing top cover while the Mi-171 roped, winched and chuted various people and items and and out of the cabin. The display wasn't especially dynamic, but that wasn't really the point. Remarkably, given the age of the type and the numbers built, this was the first time an operational Hip had ever displayed at a UK airshow. A debut of both display and type that the Festival organisers can be pretty proud of, and definitely one of the highlights of the 2017 season. Despite a strong lineup, the show didn't quite have the charm or atmosphere that has traditionally been associated with the airport's shows. It's hard to put your finger on why, though. The static wasn't especially large, but it had quality (including the Ghanian registered Wessex). Perhaps it was the patchwork flying programme, with some large gaps at times by accident or by design, especially as it began a considerable amount of time after the advertised starting hour. Perhaps it was just the weather, which was pretty grim across the whole three days. The Biggin Hill Heritage Hangar closed the show with a trio of fighters, but somehow that didn't quite seem enough, with the majority of their stable on the ground (disappointingly, the Bf 109E1 being restored in their sheds wasn't ready in time for the show). It feels unfair to criticise a show on something as subjective as atmosphere, but even with such stars in the lineup there was an oomf missing from the show. A shame to end on that note, especially with the airport celebrating such a significant anniversary - so let's hope that next year's edition can regain some of the flavour, some of the charm that shows before have offered, and perhaps with some unique international elements once again.